It's only fifteen seconds, but it is fifteen seconds of one of the best Optimist Club projects that I've seen. The Cocoa Beach Optimist Club, Florida, coordinates a huge fishout with a $10,000 prize. Take a look at all the fun and imagine what your Optimist Club can do in its community. John Baldoni is the chair of leadership and development at N2Growth. He has been recognized internationally as an educator and executive coach. In this message, he shares what we believe optimists should know, but may need to be reminded of, in order to live joyfully and to help others live joyfully, too. According to Baldoni, optimism breeds joy. 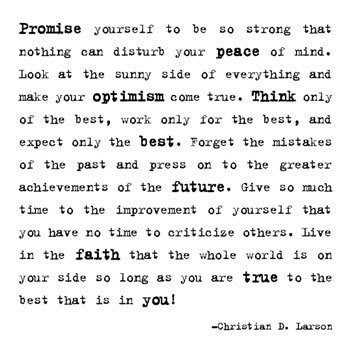 Be joyful, my friends and fellow optimists. Merle Haggard passed away this week. It seems that more and more celebrities who are my parents' age are turning up in the obituary column. Of course, I lost my parents more than twenty years ago; but somehow, still reading the names and listening to music, among other things, from their era has always made me feel grounded and close to them. If I lived near where I grew up, I might find affinity in other things. Last year, I took a four-month gig in St. Louis and was surprised at the many changes that had occurred over my fifteen-year absence. Favorite restaurants had closed. Busch Stadium was torn down to make way for a new, improved baseball venue. Casinos rest stately on both sides of the Mississippi River and the interstate highway system now surrounds the metropolitan suburban area as had always been planned. All is good, even if the memories bring a bit of sadness as I remember what used to be. Growth and change spur rebirth and fuel the evolution of our culture and comparing the old and the new help us tell our stories: we say where we came from and where we've been, how we got there, and how or why we returned. It is both noble and optimistic to share our stories. 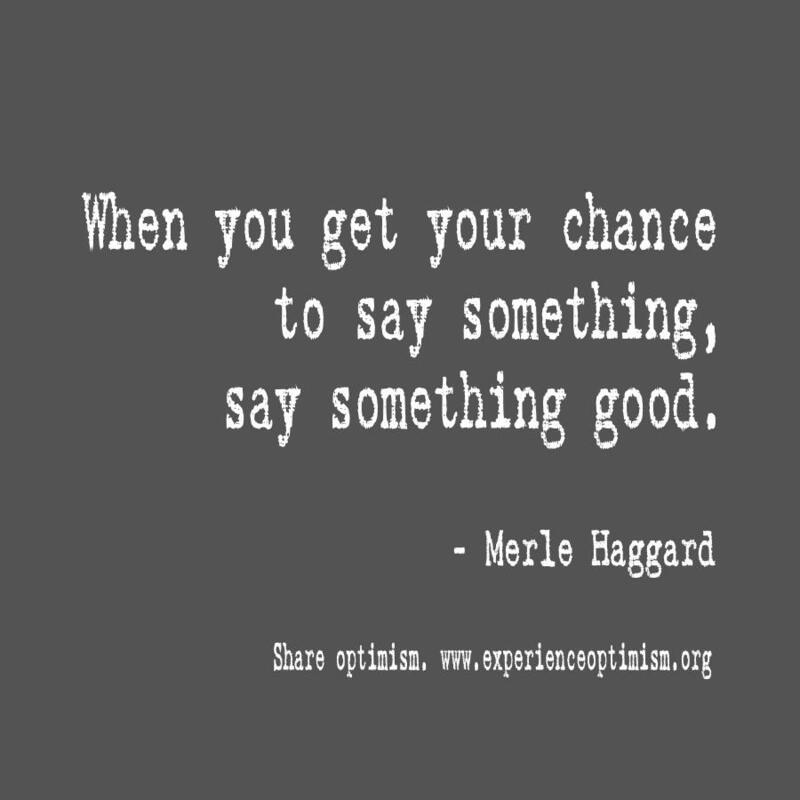 Merle Haggard said, "When you get your chance to say something, say something good." 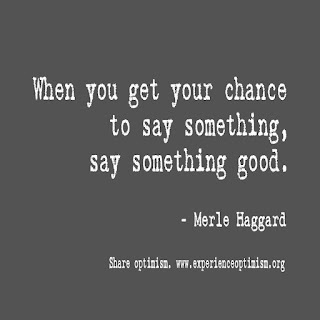 On first blush, I thought Mr. Haggard was reminding us to share optimism and to tell about the good things that happen in our lives. Then I thought, that doesn't sound like a country and western song at all. Such a dichotomy! Then I gave it some more thought and it occurred to me that good has different meanings. According to Dictionary.com, as an adjective, it means "to be desired or approved" or "having the qualities required for a particular role." As a noun, it means "that which is morally right" or "benefit or advantage to someone or something." And as an adverb, good means "well." Country and western singers are storytellers and their stories span the entire human condition and social environment. That includes happiness and sadness alike and to entice the audience to listen to both emotions, storytellers must do their craft well. No, excuse me, I meant to write, as did Merle Haggard, they must say something good. In this case, I believe his call is for excellence in thought, word and deed. April 1, 2016 - Some say that today is April Fool's Day. I prefer to believe that today is a call to action. Today is the day that we come out of our winter hibernation and spring into life. We make plans for the days ahead knowing that the sun will shine more often than not. We know that the green grass and budding flowers will continue to paint our landscape with a kaleidescope of color. We can't help but be happy at this time of year. Do you know what else will make you happy? 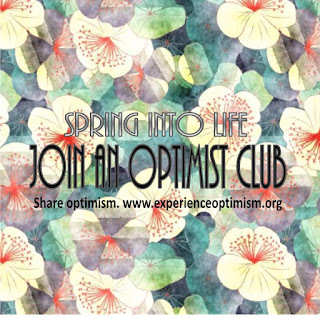 You will be happy when you join an Optimist Club. Joining an Optimist Club serves as an extra reminder that one should think and share positive thoughts with those around them. It is not only a reminder, but a extra push, that one should work with others to offer community service in order to make their community great again. It is also a wonderful way to find friendship and fellowship with people who want to celebrate what is right with the world. Please let this post be your reminder to Spring into Life: Join an Optimist Club today. Find an Optimist Club here. Send me, Linda Vaught, an email and I'll help you start an Optimist Club in your community.